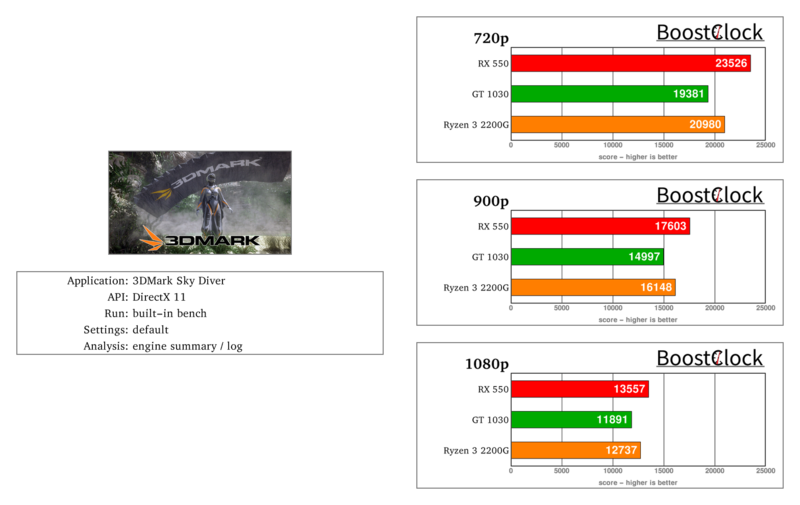 With Sky Diver - the benchmarks is aimed at gaming laptops and mid-range PCs - we got consistent results with all three resolution, both the RX550 and R3-2200G outperformed the GT1030. Using Fire Strike - the test targets high performance gaming PCs - the RX550 has a noticeable lead, on the other hand the GT1030 beats the smaller OCed Vega8 APU by a whisker. Time Spy is Futuremark's latest benchmark, testing the DirectX 12 API performance of modern graphics cards. There is not much difference between the three tested configurations. The API Overhead test calculates the maximum number of draw calls that a system can handle utilizing different graphics APIs. 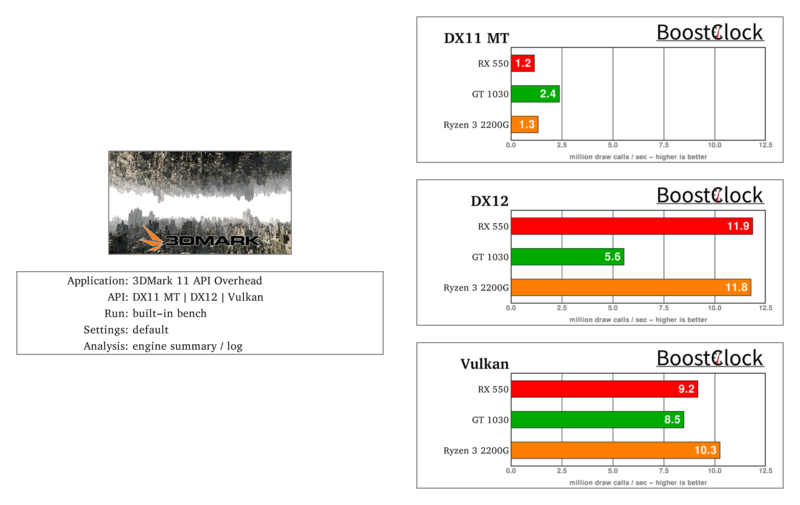 AMD struggles with the DX11 test, while shines using DX12 and Vulkan. 3DMark 11 is the only test where the new Ryzen 3 came out on top compared to the entry level dGPUs - using the Entry level preset. 3DMark 11 was released in 2011, so might not be that representative, even Futuremark recommends using Fire Strike and Sky Diver instead. Nevertheless, the results were consistent across all runs and resolutions.